A Roman Catholic indulgence, dated Dec. 19, 1521. 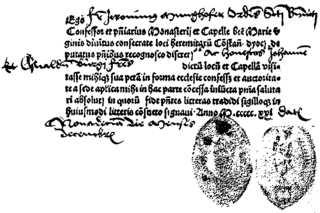 The use of the printing press made possible the mass production of form documents offering indulgences. An Indulgence, in Roman Catholic theology, is the full or partial remission of punishment for sins. The indulgence is granted by the Church after the sinner has confessed and received absolution and involves certain actions by the recipient, most often the recitation of prayers. Indulgences may also be obtained on behalf of a deceased loved one. Prior to the modern period, indulgences could be obtained by offering a certain amount of money as alms to the Church, and in some cases were offered for forgiveness for sins not yet committed. This "selling" of indulgences was first practiced in the late thirteenth century and was changed after the Protestant Reformation, which was sparked in 1517 by Martin Luther's objections to abuses of the tradition. In 1567, following the Council of Trent, Pope Pius V outlawed financial giving in relation to indulgences. Absolution certificates used by the Eastern Orthodox Church, first seen in Jerusalem in the sixteenth century, ceased entirely by the beginning of the twentieth century. In Roman Catholic theology, indulgences are granted for personal sins—specific sins committed by a person—as opposed to the inherited Original Sin. Such sins are either mortal or venial ("light"). Punishments for sin can be either temporal or eternal. Temporal punishments are temporary punishments—those that affect us in this life or in purgatory. The more temporal punishments one incurs, the more suffering one must endure on earth or in purgatory. Eternal punishment, on the other hand, is everlasting. Even though one may be forgiven of a mortal sin (through the sacrament of Reconciliation)—and relieved of the eternal punishment of Hell—temporal punishments may still remain. Indulgences may be either plenary (complete) or partial. An indulgence is granted to deal with the remaining temporal punishments due to sins that have already been forgiven. The sacrament of reconciliation removes the guilt of sin and restores the penitent person to a state of grace. However, temporal punishments may still remain. In other words, although God has mercy upon sinners who repent their sins—thus enabling them to avoid eternal punishment in Hell—His justice still requires that the sinner be punished for the wrongdoing. An analogy might be a convicted murderer who has been given the death sentence but is granted clemency because of his authentic remorse, yet must still serve time in prison. Thus, even though an individual is in a state of grace, if he dies without having served any remaining temporal punishments, he is not yet qualified to enter Heaven. Therefore, these individuals “enter” purgatory, where the punishment they owe is "purged." Indulgences occur when the Church applies merit from its spiritual treasury to an individual, enabling him or her to be relieved from punishments which would otherwise have to be purged through suffering in purgatory. Pius V declared that indulgences could no longer be related to fees or donations. The Church changed its attitude toward some issues regarding indulgences after the Protestant Reformation. 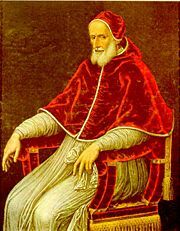 In 1567, following the Council of Trent, Pope Pius V issued a decree declaring that it is forbidden to attach the receipt of an indulgence to any financial act, including the giving of alms. In addition, the only punishment remitted by an indulgence would henceforth be existing punishment, that is, for sins already committed. Thus, indulgences would no longer be issued that could be used, in effect, as a license to sin. An individual may still gain the indulgence for a specific individual in purgatory other than himself. To gain an indulgence, an individual must be “in communion” with the Church, and have the intention of performing the work for which the indulgence is granted. To be “in communion,” the individual must be a baptized Catholic without any un-reconciled mortal sins and must not be dissenting from the Church’s teaching. The doctrine of indulgences was a major source of controversy in the Western church, leading to the start of the Protestant Reformation. The ability to grant full or partial pardons from the punishment of sins had been used by members of the Catholic hierarchy for many centuries. In the Middle Ages, however, a growing sense of ecclesiastic corruption, coupled with various political and socioeconomic factors, created a volatile situation, in which the sale of indulgences would spark a major revolution. In 1294, Pope Celestine V issued a bull of pardon in L'Aquila, Italy, offering plenary indulgences to sincere Christians entering the basilica of Santa Maria di Collemaggio. In 1476, Pope Sixtus IV decreed that a person still living could obtain an indulgence for someone in purgatory. In 1517, Pope Leo X offered indulgences for those who gave alms to rebuild St. Peter's Basilica in Rome. The aggressive marketing practices of the German monk Johann Tetzel in promoting this cause provoked Martin Luther to write his 95 Theses, protesting what he saw as the purchase and crass sale of salvation. In thesis 82, he questioned the spiritual value of indulgences. The only thing that indulgences-for-money guaranteed, Luther declared, was an increase in profit and greed, because the pardon of the Church was in God's power alone. While Luther did not deny the pope’s right to grant pardons for penance imposed by the Church, he made it clear that preachers who claimed that indulgences absolved buyers from all punishments were in in grave error. From this controversy the Protestant Reformation was launched. Luther's critique of indulgences had a tremendous impact on his world. The 95 Theses gained enormous popularity over a very short period of time. 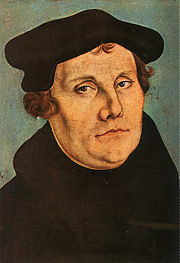 Leo X demanded that Luther recant 41 purported errors, some from the 95 Theses and others from other writings and sayings Luther, which Luther famously refused to do before the Diet of Worms in 1521, thus symbolically initiating the Protestant Reformation. 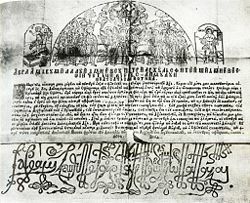 An eighteenth-century certificate granted by the Patriarch of Jerusalem and reportedly sold by Greek monks in Wallachia. Because the underlying doctrine of salvation differs from the Catholic model, indulgences do not generally exist in Eastern Orthodoxy. However, some Eastern churches did have a similar practice in the form of absolution certificates that were occasionally issued to individuals. At the beginning of the eighteenth century, for example, Dositheos Notaras (1641-1707), Patriarch of Jerusalem, stated that, "This practice was confirmed by ancient Tradition that was known to all, that the Most Holy Patriarchs would grant certificates for the remission of sins to the faithful people." Never as widespread a tradition as in the Catholic Church, absolution certificates ceased entirely in the eastern churches by the beginning of the twentieth century. Protestant denominations today frequently cite indulgences as a prime Roman Catholic error. Generally, Protestants reject the distinction between temporal and eternal debt for sins and argue that Christ paid all debts in full by his sacrifice. To receive God's grace for the remission of sins is strictly a matter of faith in Jesus as the resurrected Lord and has nothing to do with indulgences. Any need of the sinner to merit remission of divinely imposed penalties, argued Luther, obscured the glory and merit of Christ and overthrew the Gospel of unmerited salvation for Christ's sake. Luther in particular criticized the Catholic understanding of the "Office of the Keys," which the Roman Church believes were given by Christ to Saint Peter as the first pope. In this view the Office of the Keys is a legislative power given to the pope authorizing him to create conditions and means for salvation. Luther's understanding was that the Keys were bestowed on the whole Church, administered publicly by all the clergy equally, and consisted of the command of Christ to forgive the sins of the penitent and retain the sins of the impenitent. Under the right use of the Keys as commanded by God, no bishop or pope could possibly have the authority to set up additional means of obtaining forgiveness, whether canonical satisfactions or indulgences. While Protestants continue to express a sense of a completed atonement similar to Luther's, the Protestant doctrine of the Keys is found almost exclusively among Lutherans today. Pope John Paul II's General Audience on Indulgences — September 29, 1999 www.vatican.va. The Apostolic Penitentiary publication on 'The Gift of the Indulgence' www.vatican.va. This page was last modified on 2 March 2018, at 21:10.